Sealant application made easy. Stan's NoTubes 2oz Injector delivers exactly the right amount of sealant for most mountain bike tire with no mess or waste. 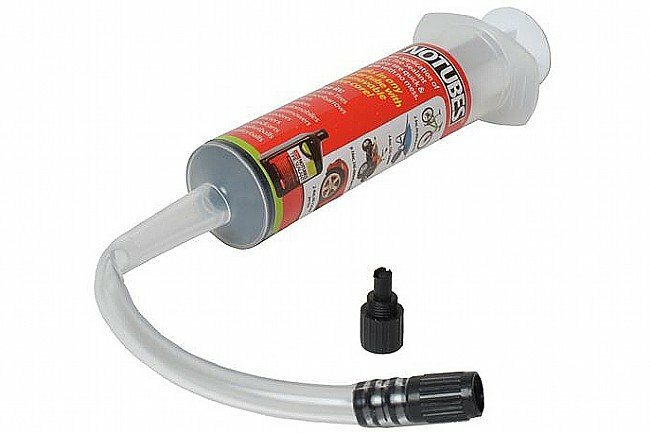 Stupid easy to use and makes tubeless refills a simple task. A no brainer if you have a removable valve core. It's Stan's setup. what more is to be said. everything he put together for tubeless works great - just be sure to watch the instruction videos on his website. Doesn't seem to screw into presta value core, have to hold in place while injecting thus a little messy. Out of the box the fitting does not work on Presta stems. I used a small piece of vinyl tubing as a sleeve over the presta stem to space it to fit the nozzle on this syringe. You must remove presta valve core otherwise pressure of syringe closes valve and makes it difficult if not impossible to fill tire with sealant. With a sleeve as spacer on stem it works well. The nozzle should have a threaded adapter included to fit Presta stems, otherwise a great tool. If you're going tubeless you're going to want this. It just makes life so much easier. A great solution that is simple and effective. Plus it cleans up easy. Riding tubeless for a couple of years now. Got the tire mounting down, but really no way to avoid slop and wasted sealer, until now. 20 mins to to pull tire, clean rim, replace stem, replace tire, and fill without a drop on the floor. Already bought a second to give as a gift. 6 of 12 customers found this review helpful. Doesn't work if you don't have removable cores in your presta valves. Most do not! Clean, easy, and sure way to add sealant. Maybe the best $10 I've ever spent on bike gear. I've tried every other method for adding sealant to my tubeless tires and nothing is as easy and clean. The brass adapter makes a tight seal on the valve so all the sealant goes into the tire not on the floor. Shake the bottle of sealant and squirt it directly into the injector and you don't have to worry anymore about the sealing crystals settling out and being left behind when you add sealant. Are there cheaper ways to do the job? Yes, but do yourself a favor, don't get cheap at the wrong time.